Supply Management services guarantee to the companies the availability of a panel of reliable suppliers that will be suitable to sustain the business, to develop competiveness and to support every future possibility of growth and expansion. These supply management activities include the management of every possible relationship with suppliers: from the occasional supply of commodities, easily available on the market, to more challenging collaborations with suppliers that can be extended to strategic fields of the core business of the company (technology, innovation, sharing of strategic resources, customer service). 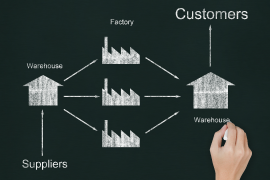 The supply management process is usually supported by IT supports open to internet (e-procurement) and it manages all the evolution phases of the relationship between the company and the supplier (market research – qualification of the suppliers – introduction to the company – classification – development – end of the contract). How to organize the supply management, for the different business units, in order to direct the results to real business needs, increase the safety of the operations and improve the economic result? How to facilitate the introduction of challenging suppliers to stimulate an increase the competitiveness in the market of goods that are usually dominated by incumbents? How to organize the control and evaluation systems for the suppliers in order to chose them correctly and motivate the ones that are most relevant for the core business of the company? How to guide implementation of the suppliers’ development strategies that increase their managerial and technical potential, while at the same time controlling their loyalty to the contracting company? How to protect the knowledge and the intellectual properties of the company?